Magdalena’s birthday was coming up and so was the inevitable question – where should we go to celebrate? Every year had followed a similar pattern; a trip to London involving a museum or exhibition; a nice meal and culminating with taking in a West End show. Well, this year it was time for change. Handmade Kent (there’s a clue in the title) is all about extolling the many pleasures of the Kent countryside and coastline. So, having previously visited Rochester, Reculver, and Margate, I decided to continue our journey along the north east coast to the pretty seaside town of Broadstairs. We arrived about 10.00 and our thoughts immediately turned to breakfast. Several places caught our eye but we eventually plumped for the Royal Albion Hotel with a view of Viking Bay. The interior was dark brown leather sofas and wooden tables set against a light white background with an airy relaxed atmosphere. My full English was a predictable choice but certainly hit the spot and the Americano coffee left a pleasantly frothy yet bitter taste. The birthday girl was a little more stylish in her choice – Eggs Benedict topped off with salmon. We very nearly visited the museum inside Crampton Tower by the railway station but instead decided to walk off the excellent food with a wander along the bay. Actually Broadstairs has seven bays. The town’s main beach Viking Bay is horse shaped with a pleasant cliff top promenade walk and several foreign schoolchildren groups were screaming happily as they braved each other to splash into the sea. Why do I get the impression that for tourists to actually swim in the North Sea they would have to scream first? Accidentally on purpose, our leisurely walk took us in the direction of Morelli’s Gelato on Victoria Parade. Morelli’s first opened their ice cream parlour in the thirties and is something of a Broadstairs institution. Although we’d hardly yet walked off our breakfast, we quickly found we’d walked into an ice cream purple heaven. I took a deep breath and ordered a conventional banana milkshake, and soon found that Magdalena wasn’t going to be so unimaginative. Her only problem was to choose just three flavours. Several head scratching moments later and she was walking back with pistachio, hazelnut and mint ice cream which occupied her attention for a good half an hour. So far, we’d eaten, gone for a walk and then eaten again. So it was time for another walk; this time to the village of St Peter’s about twenty minutes inland. The reason for visiting this lovely village was because I’d booked a St Peter’s Village Historic tour. This was a two-hour walking tour of the village interspersed with a series of entertaining costumed presentations about the sights, buildings, history and characters of the village. The walk only covers about a mile in total, which gives you an idea of the number of engaging group and individual activities along the way. The quality of the acting may have varied at times but the enthusiasm of the volunteers never wavered. We quickly learnt about Methodism and smuggling, conditions in the workhouse and breakfast concerts for the fashionable elite of Broadstairs. Humour was never far from the presentations, especially from the trio of reprobates lying locked in the stocks who traded repartee in between telling us how they’d ended up in such an unfortunate and lowly position. 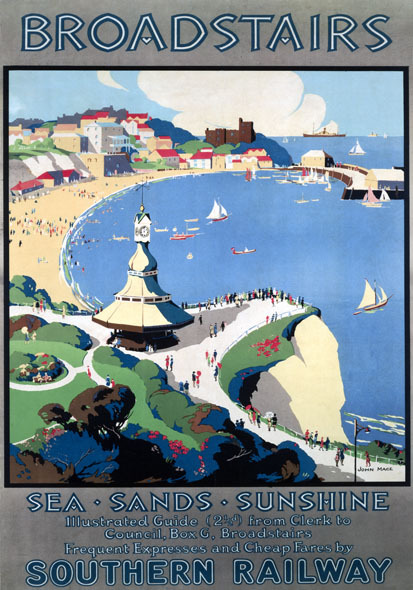 There can’t be much more enjoyable ways of learning about Broadstairs’ rich history. But eventually we had to drag ourselves away, only because I’d booked afternoon tea at Bleak House. Well, after a two hour walk, not to mention another half hour back to the coastal cliff top location, we were in need of more food. Now a hotel, Bleak House, was the former home of Charles Dickens. You can visit the study where he wrote ‘David Copperfield’ and the upright writing board which allowed him to gaze at the sea view for inspiration. There is also a Smuggling Museum which houses various exhibits and artefacts from local shipwrecks. It was originally a fort and is the only four story grade II listed mansion in Broadstairs – although it has been enlarged since Dickens’ time. We ate inside in an ornate room although we could have chosen to battle with the swooping seagulls out on the terrace. The complimentary bubbly was a nice touch and the staff kept refreshing our tea, which was served in a huge pot. There was a selection of sandwiches, fruit scones, clotted cream, mini patisseries and preserves and we had plenty of time to admire the grandeur of the surroundings while steadily working our way to the top of the tea stand. We slowly walked down a series of winding alleyways back the town. By now the afternoon sun had given way to persistent light drizzle and we stopped by the Palace Cinema. Built in 1911 it was formerly a puppet hall and most of the a hundred or so seats are below street level, which gives it the appearance of being smaller than it really is. Whatever its actual size it looks decidedly quaint from the outside. Sadly for us, all the tickets for that’s night performance were already sold out for. Screenings are often preceded by a live music performance by the resident organist who also co-owns the cinema. The cinema’s website has a link where you can see a clip of him playing. The light was fading as we walked back to the car but over a month later, as I write this piece, the memories are still vivid. The bright lights of London may have their attraction but the look in Magdalena’s eyes outshone them all as we left Broadstairs glittering in the distance.